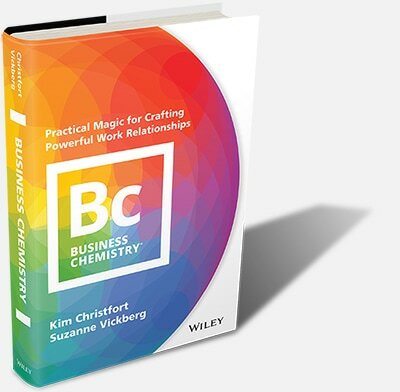 The stress study: Business Chemistry® has been added to your bookmarks. 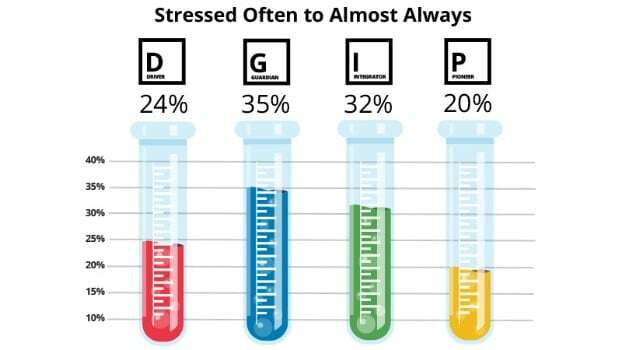 The stress study: Business Chemistry® has been removed from your bookmarks. In new research from The Deloitte Greenhouse™ Business Chemistry® team, working styles and preferences can impact how we experience and cope with stress. Understanding the differences is a powerful step for teams looking to improve their working relationships, and ultimately, their performance. Stress. It may be one of the most talked about workplace topics of our time. Enter “workplace stress” into a search engine and you’ll find thousands and thousands of articles outlining what’s stressful, why it’s stressful, how to cope, and the consequences if we don’t. Increasingly, stress at work is acknowledged as an engagement-sapper, a productivity-stealer, and a dangerous health risk. But is everyone really that stressed out all the time? Do some people experience the workplace as more stressful than others? What strategies do people most often use to cope? In the past year, Deloitte’s Greenhouse Experience Team has embarked on a large-scale study of professionals to find out. Through an online survey we asked people a series of questions about their stress levels, how stressful they find various workplace events and circumstances to be, how effective they are under stress, and how often they use a variety of coping strategies. In addition to answering questions about stress, all respondents completed the Business Chemistry® assessment, enabling us to compare their responses to the stress questions with their Business Chemistry type. We found statistically significant differences between Business Chemistry types in several areas. But, before we get to that, let's review our findings. Curious about someone’s Business Chemistry type? Create a hunch here. More than 23,000 people were asked how often they experience stress. Of these respondents, the majority said they’re stressed only rarely (15 percent) to sometimes (57 percent). We found this a bit surprising, given the centrality of stress in conversations about the perceived ills of today’s workplace. Overall, 25 percent said they’re stressed often, and just three percent, almost always. In terms of the situations people found stressful, realizing one had made an error was at the top of the list, causing stress for 82 percent of respondents. Apparently, most didn’t feel it was okay to make a mistake. Face-to-face interactions like delivering a presentation or meeting a new stakeholder (45 percent). A second sample of more than 17,000 people answered questions about the strategies they use for coping with stress. Diving right in and tackling the issue head-on was most popular (used by 83 percent of respondents); followed by cognitive coping strategies like stepping back to consider the big picture or thinking through possibilities (79 percent); reverting to groundwork like organizational tasks or seeking further information about the situation (78 percent); using interpersonal coping strategies like talking to someone about their feelings or bouncing ideas off of them (47 percent); and taking time out to do something else like socializing or exercising (46 percent). Want to find ways to unlock potential? Perhaps even more illuminating than our general findings are the Business Chemistry differences our study revealed. Guardians were the most likely to report experiencing stress, followed by Integrators. Further, Guardians and Integrators found each type of situation we asked about to be more stressful than did Drivers and Pioneers. When it comes to coping, the Business Chemistry types reported using different strategies in varying degrees. While taking action was common among all types, it was reported most frequently by Drivers. Guardians used groundwork strategies most often. Pioneers favored cognitive strategies more than other types did, and used the most strategies overall. Integrators didn’t show a strong preference for a particular coping strategy, using action, groundwork, and cognitive strategies to similar degrees. We also asked this second sample of respondents about the level of stress under which they’re most effective. The majority of Drivers and Pioneers (61 percent and 59 percent, respectively) indicated they’re most effective when moderately to very stressed. Fewer Guardians and Integrators (50 percent and 51 percent) said they were most effective at these levels of stress. Learn more about the four types of Business Chemistry here. Why do we see these differences in stress levels? One reason may be the pace of today’s workplace. Guardians generally prefer to work in a methodical and deliberate way, making sure the details are covered and decisions are considered carefully. Integrators often prioritize getting input from others and reaching consensus in a group. Both types tend toward respecting the tried and true, and if not avoiding risk, then at least carefully weighing it. These ways of working can bring tremendous value to a team—enhancing quality and cohesiveness--but they can be difficult, and apparently more stressful, to maintain in the face of a fast-moving workplace. Pioneers and Drivers, on the other hand, are more likely to thrive when the pace is brisk. There are other possible reasons for these differences. For example, Guardians and Integrators are more likely to internalize mistakes, spending a lot of time reflecting on what they might have done differently, while Drivers and Pioneers are more likely to brush mistakes off. Guardians and Integrators are also less likely to take charge in group settings, which means they may be more likely to get jostled around--much like being in a car on a winding road, the likelihood of getting motion sickness is higher in the passenger seat than in the driver’s. Finally, there’s another factor, akin to introversion and extroversion, which becomes obvious only when we further break down the Business Chemistry types into inward- and outward-facing types. Guardians are joined in the inward-facing category by Dreamers (a subtype of Integrator) and Scientists (a subtype of Driver). Pioneers are joined in the outward-facing category by Teamers (a subtype of Integrator) and Commanders (a subtype of Driver). The outward-facing types are generally more outgoing, energetic, adaptable, and competitive. They are also typically less stressed. This finding is corroborated by the vast body of work on introversion outlined by Susan Cain in her book Quiet: The power of introverts in a world that can’t stop talking. Cain highlights many reasons that introverts might experience more stress, from the biological (introverts likely have more sensitive neurological systems) to the cultural (extroverts are more valued in today’s "culture of personality"). Our study suggests that some people are experiencing quite a bit more stress at work than others, and further, that one’s Business Chemistry type may be a predictable way to identify who those people are. We’d venture to guess that few teams can afford to have a large proportion of their members working below capacity. Assuming stress impacts engagement, productivity, and worker health in the ways it’s purported to, organizations and teams might want to pay special attention to their inward-facing team members, particularly their Guardians and I-Dreamers, to understand what might be done to reduce stress levels. Not only do these types likely represent a large proportion of any workforce, but they often bring particular strengths that can add value to a team—like conscientiousness, strong listening-skills, and detail-focus. Most teams have a diversity of styles working together toward common goals. We’ve found that understanding differences is a powerful first step for such teams looking to improve their working relationships, and ultimately their performance. 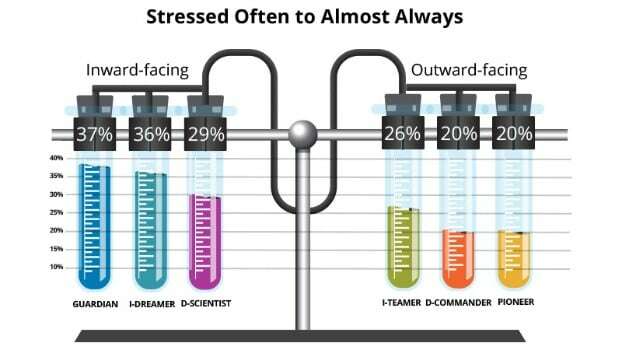 These findings on Business Chemistry and stress add to the knowledge-base that can help teams do so. Read more about the study methodology here.